The English city of Nottingham has never been a fine-dining destination. But that's changing, thanks to Sat Bains, a 39-year-old of Punjabi descent and one of the U.K.'s hottest chefs. His Restaurant Sat Bains, www.restaurantsatbains.com, is the first in the city to hold a Michelin star, earned for witty, ultra-seasonal cuisine. Take Bains' award-winning starter of egg, ham and peas, which bears no resemblance to the common dish found on the menus of England's roadside cafés. It comprises peas of three textures (pea shoots, braised in ham stock and made into a minted sorbet), a runny duck egg and shards of Jabugo ham. Or his horseradish croquette, served with pickled elderberries, crab apple and a powder made from hazelnuts and tansy flowers, all exuding the terroir of the English East Midlands. Sense of place is vital to Bains, who is often found in the woodland close to his restaurant foraging for things such as chickweed and Sherwood cèpes. Bains' Sikh upbringing shows through in idiosyncratic spicing  like his sweet-and-sour jus made from Douglas fir pine, served over blackberries with tarragon and rocket granita and a soft meringue. Chocolate desserts, too, are very different: Eastern Congo chocolate mousse is partnered with yogurt curd, cumin caramel and crumbs of chocolate shortbread. Bains' latest innovation is to provide a list of seasonal ingredients, from Hereford snails to cobnut-oil pastilles. 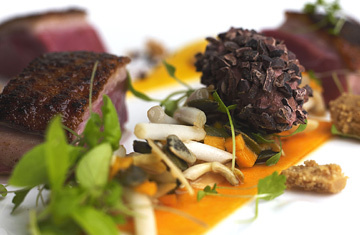 Customers are asked to select 10 (48 hours in advance of dining) and a bespoke menu is created. Says Bains: "It's exciting for the customer, lets the ingredients shine and is a fresh challenge for the kitchen." And if it seems a shame to head back to reality straight after a magical repast like that, no matter. Restaurant Sat Bains comes with seven very comfortable guest rooms in which you may sleep off your meal and awaken to a Sat Bains breakfast. Dining-and-accommodation packages start at about $210 per person. Got an awful travel gripe? The Avenger may be able to sort it out for you. Click here to tell us your problem.